0.2% Hyaluronic Acid in gel form. Safe to use as an adjunct therapy. Optimend™ Corneal Repair Drops enhance the natural healing process for corneal ulcers presented in horses, dogs and cats. The 0.2% Hyaluronic Acid gel binds to the eye surface to facilitate healing. It is safe to use as an adjunct therapy. 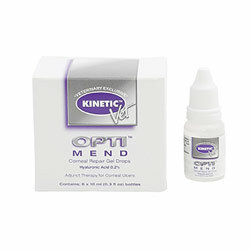 OptiMend Corneal Repair Drops are fortified with 0.2% HA in gel form to bind with the eye surface and enhance healing. Non-irritating, non-immunogenic and safe to use as an adjunct therapy in dogs, cats and horses. Veterinarians prescribe Optimend Corneal Repair Eye Drops to help heal corneal ulcers in dogs and cats. The active ingredient, Hyaluronic Acid, speeds the eye’s natural healing process. Use gloves or wash hands prior to application to assure sterility and cleanliness. Place 1 to 2 drops directly on the affected eye(s). The drops may be placed directly on the cornea or into the conjunctival sac. The natural movement of the eyelid will distribute the gel over the eye surface. Gel drops should be applied 3 times daily until the corneal repair is complete. To avoid contamination, do not touch the tip of the container to any surface. Replace cap after using. Discard unused portion after use. Water, Glycerin, Benzalkonium Bromide, Triethanolamine, Hydroxyethyl Cellulose, HA, Taurine, Dipotassium Glycyrrhizate, Pyridoxine HCl, EDTA, Sodium Hydroxide. Federal (USA) law restricts this product to use by or on the order of a licensed veterinarian. OPTIMEND Corneal Repair Drops help the natural healing process for corneal ulcers. OPTIMEND Corneal Repair Drops contain 0.2% Hyaluronic Acid in gel form. HA is a natural substance found in the tissue throughout the body that facilitates tissue repair. OPTIMEND is formulated for use in corneal ulcers presented in horses, dogs and cats. Safe to use as an adjunct therapy. 1. Use gloves or wash hands prior to application to assure sterility and cleanliness. 2. Place 1 to 2 drops directly to the affected eye(s). the drops may be placed directly on the cornea or into the conjunctival sac. The natural movement of the eyelid will distribute the gel over the eye surface. 3. Gel drops should be applied 3 times daily until the corneal repair is complete. 4. To avoid contamination, do not touch tip of container to any surface. 5. Replace cap after using. 6. Discard unused product after use. Product should be stored at room temperature, away from a heat source, or may be stored in a refrigerator. If stored in a refrigerator, product should be allowed to warm to room temperature 15°-30° C (59°-86° F) prior to use. PROTECT FROM FREEZING. WARNING: FOR ANIMAL USE ONLY. NOT FOR USE IN HORSES INTENDED FOR HUMAN CONSUMPTION. To report adverse reactions, call 1-877-786-9882. For customer service or to obtain product information call 1-877-786-9882.